In 1968 the company began selling and servicing cranes and hoists for industry including products from Twin City Monorail Cranes and Monorails, Low Head Hoists, Morris Wheeler Canes, Conco Cranes, as well as other material handling products associated with the lifting industry. Cordell Quality Bridge Crane Systems – Designed to lift and move your bottom line. Cordell provides a high level of personal service that begins with the design engineering process and carries through the installation and field service work. Our quality service begins with trained and knowledgeable people who provide solid solutions to our customer’s material handling needs. Quality products applied correctly by professionals reduces your operating costs and lifts your bottom line. 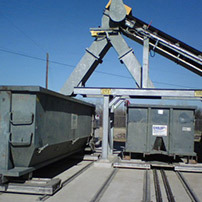 The Dumpster-Veyor is designed to allow roll-off containers to be moved forward and reverse for even distribution of material deposited from a fixed source. An engineered solution to container management that reduces costs, improves efficiency and operator safety. Standard Lifting Products – Put these Pre-engineered products to work for you today. For nearly a half century Cordell has been providing quality pre-engineered lifting systems to industry. We have selected only the finest brands with a proven track record to offer our customers. Check these great pre-engineered cranes and hoists out and give us a call, we can help with your lifting needs. Cordell Service provides field services for Equipment Repairs, OSHA Inspections and Load Testing. Our Service Vehicles are stocked with parts and tow our own scissor lifts, so when we arrive we are ready to go to work and get your equipment up and running as soon as possible. No waiting for your scissor lift or a rental unit, and in many instances, we can an get your equipment operating with parts we have on our truck. 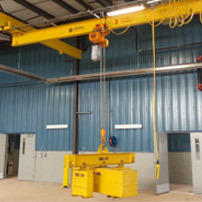 Loadhook.com provides pre-engineered lifting equipment including electric chain hoists, gantry cranes, jib cranes, radio controls, hand chain hoists, end truck kits, winches, drive tractors and other associated equipment. The selection of equipment represents popular solutions for a variety of industries. And remember to contact Loadhook.com or Cordell for products or solutions not found on our site. We are Crane and Hoist experts can help with special applications. Products ranging from ¼ Ton through 50 ton+ capacity including standard lifting systems, custom crane and hoisting solutions, runways, monorails, controls and accessories. Trained and Qualified technicians focused on keeping your equipment running, backed by a service department staff supporting repair parts, compliance records, load testing, scheduling and customer service. The Dumpster-Veyor is designed to allow roll-off containers to be moved forward and reverse for even distribution of material deposited from a fixed source. 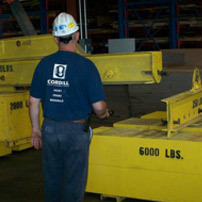 Cordell & Associates, Inc. is a family business specializing in cranes, hoists, monorails and custom lifting and handling systems for a broad range of material handling applications. For nearly half a century, we have been addressing our customers material handling problems with engineered solutions designed to perform and deliver quality results. © 2019 D.R. Cordell & Associates. All Rights Reserved.